At lunch yesterday, Kate asked my name and hers. I told her and then mentioned that we were married and have two children. Thinking that she might envision our children as little, I said, “They’re not really children now. Our daughter is fifty.” She was surprised and asked, “How old am I?” I told her we were both 78, and I would soon be 79. She said, “Well, you look it?” I said, “You think I look old?” She pointed at the hairline above my forehead and tried to say, “Look how your hair is receding.” She just couldn’t figure out how to say it. Then she mentioned my glasses and asked if I always have to wear them. I said, “Only when I want to see you.” Then I told her I was getting new ones. She said, “Are they going to be bigger?” I said “The better to see you with, my dear.” She recognized the phrase and said, “Where did that come from?” I said, “Little Red Riding Hood” and recounted the portion of the story of the wolf in bed dressed up like Grandma. As I was telling it, I mentioned that the wolf had eaten Grandma. Kate reacted with horror and, rather loudly. said, “What?” Then I had second thoughts about the wolf’s having eaten her. I pulled out my phone and Googled “Little Red Riding Hood” and brought up the full story. I started reading it aloud to her. When I got to the part about the wolf, I quickly learned that I was right. The wolf really did eat Grandma. When I read that, she reacted exactly as she had before. It was quite noisy in the restaurant, so I don’t think anyone heard her. I didn’t see any need to get out “My Wife Has Alzheimer’s” cards. I continued to read. We were reminded that the wolf also ate Little Red Riding Hood, and the hunter cut open the wolf’s stomach and saved both Grandma and Red Riding Hood. Kate was quite taken with the story and how gruesome it was. It’s hard for me to remember exactly what we said after that, but I said something about the changes in the way people look at such stories for children these days, that we take a more sanitized approach to them. It was not a conversation of great depth, but we did talk about how children generally accepted the gruesome elements as part of a fairy tail and focused on the entertaining aspects of the stories and their messages of morality. I was really taken by how engaged she was. As Kate had wanted, I went back to the bedroom to wake her about 10:30. Although she was sound asleep, she woke up easily. I reminded her that she had asked me to wake her, something I don’t recall her doing before. (I jumped on that opportunity.) She was a little groggy but got right up with a little help. I walked her into the bathroom for her shower and turned on the water. As she took off her night gown, she asked my name. I gave her my name but didn’t mention that I am her husband. She didn’t ask. When she finished her shower, she asked if she could lie down a little bit. I told her that would be fine. She asked me to come back and get her up. I came back about twenty minutes later. She got up willingly and asked about her clothes. I picked them up from the chair where I had put them earlier and put them beside her on the bed. I gave her a bra and said, “Let’s start with this.” She looked at it strangely. I explained that she could put it on over her head just like putting on a top. I told her it was easier than most bras. She looked at me and said, “How do you know so much about bras?” I chuckled and told her that I had observed her having some difficulty with her other bras that fasten in back and went online to find something easier. I found a company that makes clothing for seniors and ordered several of them. Although she asked my name off and on throughout the day, she seemed to know that I am her husband. Again, I didn’t ask, but we did talk about her parents and our children. We relaxed at home in the family room after lunch. About forty-five minutes passed. Then she asked, “What is your full name?” I told her. She asked me to repeat it. I did and said, “I’m your ‘Hubby.’” She laughed, not in a way that suggested she didn’t believe but just the opposite. She continued to work on her iPad for at least another hour before deciding to rest. I thought that was a good idea since we were going to an opera (Tosca) last night and would get home late. This was only the second time in about a year that we have attended an evening event this late. All the music nights at Casa Bella begin at 6:00 and end around 8:30. The opera started at 7:30. We didn’t get to bed until 11:30. That’s a good bit later than our normal routine. I had been looking forward to the opera and enjoyed it; however, Kate’s experience and mine were quite different. We bumped into a number of people in the lobby we have known from various places around town. I enjoyed seeing everyone, but I think it was a bit overwhelming for Kate. She didn’t appear to recognize anyone. Fortunately, each of the encounters was brief. We were seated beside and behind people we knew. Kate talked with them at the intermission. When it was over, she was eager to get home. She said she hadn’t been able to understand anything and had “just tuned out.” She said she enjoyed the music but didn’t know what was going on. That fit with my impression during the performance. Several times she responded enthusiastically to a number of the arias. Often she is able to enjoy various performances whose plot she can’t grasp. That happens when she can enjoy the characters or situations in which they are involved. That wasn’t the case last night. In two weeks we are going to see the Live in HD at The Met’s production of Carmen. That will be a good test. If she doesn’t enjoy that, live opera may soon be a thing of the past, not because of the music but a lack of understanding of the plot. I am hopeful that she will continue to enjoy opera night at Casa Bella for quite a while. In that case, the focus is on the music itself. Although Kate appreciates humor, she has never been one to joke or kid with people. It has only been in the latter stages of her Alzheimer’s that she has taken an interest in kidding me. I often think of kidding as an “art.” Not literally, of course. What I mean is that it requires the kidder to have a sense of when and when not to kid, who and who not to kid, and the way to kid. That is something Kate hasn’t mastered. What has happened is that she has lost her ability to filter what she says. Fortunately, I am the only one she kids, and I understand that she never means to hurt me. She is trying to be playful in the same way that I have been with her. It is much more common for her to say something about my looks. Yesterday at lunch, she said, “You know, you’re a nice guy. You’re not handsome, but you’re nice.” She got more specific and mentioned my nose and receding hairline. About that time, a man in a hat walked by our table. I told Kate that maybe I should wear a hat. She said, “That won’t help. If it weren’t for your personality, you would still be living off your parents.” Should I have counted that as a victory? Although Kate enjoys humor, she’s never been a kidder. I grew up with a dad who lived his whole life as a kidder. The week before his 100th birthday and two weeks before he died, a young staff member at his nursing facility asked what advice he had for someone who wanted to live as long as he had. He answered, “Don’t die.” He was a light-hearted guy who saw humor in just about everything. He was even a “cut-up” in the emergency room where we made any number of visits. I tend to be a more moderate version of him. That may be having an impact on Kate right now. 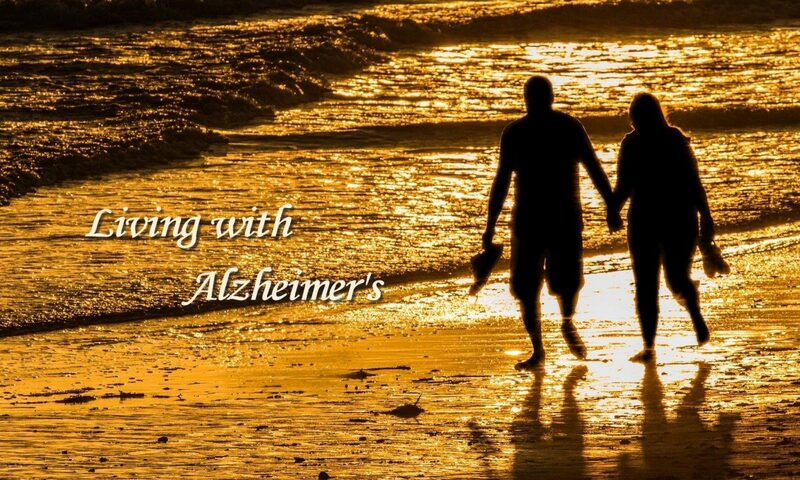 I find that she teases me a lot as her Alzheimer’s progresses. Not being a kidder by nature, it often fails to come across as humor though I recognize it as such. I’ve had a few examples of that already today. Out of the blue at lunch, she said, “Those are the ugliest glasses I have ever seen.” That’s the first time I recall her saying anything about my glasses. Usually, she comments about my nose. That has been something of a family joke. Dad had a moderately bulbous nose that seemed to be more pronounced as he got older. I inherited his nose and have been kidded about that before. We’re back home now, and she is resting on the sofa across from me in the family room. I have a Chris Botti album on the sound system. It’s a beautiful day though warmer than I would like. It looks like we’ll have a peaceful afternoon. In the car on the way to lunch today, Kate said, “What city is this?” I said, “Knoxville, Tennessee.” A couple of minutes later, she asked again. I said, “Knoxville, Tennessee, where we have lived for 47 years.” She was surprised as she always is when I tell her this. She said, “I guess that means I’m old.” Though I am only six months older than she, I said, “Think about me. I’m 78.” With a smile on her face she quickly responded, “Well, you’re ancient.” She still has her sense of humor. While we were at lunch, she asked me at least three more times where we were. One of those times was immediately after I had told her. A similar thing happened on the way home after lunch. She asked me to tell her my full name. Right after I said it, she said, “Say it again.” I did and then asked her to say it. She got the first name but was stumped on my middle and last names. She didn’t express any frustration. She just laughed. I laughed with her. Of course, it’s really sad, but it feels good to laugh, especially when she initiates it. Today was my day to donate platelets at the Red Cross. When I got home, the first thing the sitter said was, “She is so smart.” I said, “I know she is.” Then Mary explained why she said that. She told me that she was watching a TV show with a judge in a courtyard scene when Kate said, “That’s not right. It’s . . .” My Kate, always the English teacher, had corrected the grammar used by someone on the show. Mary added, “And she wasn’t even watching the show. She just heard it.” I told her our grandchildren could tell their own stories of being corrected by Nan. Then she said, “Last week, she corrected me.” I didn’t tell her I have been corrected quite a few times over the years. I love knowing that she is still able to detect errors in grammar. After Mary left, I walked over to Kate. She said, “I’m so glad to see you.” I said, “I’m glad to see you.” Then she added, “I really mean it. I feel so much better when you are here.” When I had walked in the room, it sounded like the two of them were getting along fine. I said, “But you like Mary, don’t you?” She told me she did, but “it isn’t the same.” I gave her a hug, and she said, “I really mean it.” One of the many things for which I am grateful is that Kate is so loving and appreciative. That strengthens my desire to be the best caregiver I can be. She makes it easy. After that, she said she wanted to brush her teeth before leaving. As usual, she didn’t even ask about going out, she just assumes when I return we will leave together. So far that is what we have done every time I have come home after the sitter has been with her, never because I initiated it. When we got in the car, she asked, “Where are we right now?” I told her we were at our house in Knoxville.” Once again, she said, “I thought so.” She may have, but I know that today she has asked that quite a few times. Obviously, she is not sure. As I have said before, she doesn’t show any signs of frustration when she asks. She seems to be adapting well. Something else to be grateful for. It’s hard for a caregiver to win every time. Last week I had someone out to the house to replant flower pots on our front porch and the patio. Since Kate has always handled these things herself, I wasn’t sure how she would take to having someone else do it for her. I decided the best way to approach it was to tell her that this was an anniversary gift to her. While we were in Asheville, the floral person took care of the pots on the front porch. This was just a small step in the process, and I hadn’t mentioned it to Kate. This morning I noticed some trimmings around one of the pots when I turned off the porch light. As I walked back to the kitchen, I wondered if Kate had started pruning on the new plants. Then I thought that was unlikely. I got more curious as I started to leave for my morning walk and decided to check. As you know doubt predicted, she had been at work, but it was only a partial effort. The floral person had planted a sky pencil in the center of each of the two pots to the side of the front door with some cascading plants around them. Kate had cut back half of one of the sky pencils so that one half is untouched with the other now half as tall as it was to start with. I started to say I was frustrated by this, but that really isn’t so. I think of it as a humorous everyday occurrence. It doesn’t have any serious consequences, and it would be a simple matter to replace the whole plant. It’s possible that we won’t even have to do that. I’ll let the expert handle that; however, it’s a good illustration of the little everyday things that a caregiver, at least this one, doesn’t anticipate. Yesterday morning as I was starting the car for our trip to Panera, Kate opened her door and said, “Wait a minute.” I saw her flip something out of her hand in an underhanded, backward motion. Then she looked back. With a big grin on her face, she said, “It went right in.” She was proud as a child who has thrown a piece of paper rolled into a ball from across a room and into a waste basket. In her case, she had thrown a tissue in the basket she keeps in the garage for all of her used tissues, paper towels, and toilet paper. She uses them to wipe the saliva from her mouth. Yes, she is still not swallowing her saliva. As I have often said, Kate handles herself well in social situations and has done so since we arrived here in San Angelo. Before she got up yesterday morning, Ken, Virginia, and I talked about how well she is doing. Of course, she slips up occasionally. That occurred last evening when we left our table at the restaurant and moved to an adjoining coffee shop. Ken and I went to the counter to order our dessert while Kate and Virginia selected a table. I should add that we have known Virginia since 1993 when she and Ken got married. Later Virginia told me that Kate said, “How do you know Ken?” Virginia answered, “He is my husband. I am his wife, Virginia.” She said Kate’s face lit up and she said, “I’ve heard your name. I’ve heard such wonderful things about you. I am so glad to put a face with the name.” Although some might focus on the sad aspects of memory loss at at time like this, Virginia celebrated the moment with Kate who was so happy to meet her (again). When Virginia told the the story, I felt the same way. It makes me happy to know she can experience such special moments. She had a similar experience when we first arrived on Tuesday. She saw the photo album Ken had sent to her about ten days ago. She went through it two or three times. Each time she experienced it as though it were her first time to see it. Each time she showed Ken and Virginia a page with their wedding picture.